Thurston Lava Tube, one of the popular caves in Hawaii. Although most know Hawaii for breathtaking views, you can find some of its most wondrous sights inside caves. From mountainous caverns to sea caves and lava tubes, caves in Hawaii are mysterious and fascinating. Visitors to Hawaii can spend an afternoon discovering one or more of these striking caves in Hawaii. Nestled in the Hawaii Volcanoes National Park on the Big Island, Thurston Lava Tube is a 400-foot long lava tube with 12-foot high ceiling. It is an excellent experience for those who want to extend their journey through the wake of Hawaii’s volcanoes. However, be sure to wear shoes with good traction, as the floor can be slippery. This may be one of the more popular caves in Hawaii. Another Big Island cave, the Kula Kai Caverns is one of the youngest caves in the world. A volcanic eruption created them as lava tubes within the last 1,000 years. Visitors can wander through the peculiar labyrinth of volcanic rock on a variety of tours. Options include the lighted cave tour, a spelunking tour, the crawl tour or the 2-hour tour of the caverns. This Big Island cavern extends over 40 miles long and is 3,614 feet deep. It is the longest lava tube in the world as well as the deepest cave in the United States. Visitors can venture through this unique lava tube through three guided tour options: the Lava Falls, Pit Room and the Maze tours. The Maze tour lasts between 4 to 6 hours. But it is for experienced cavers and climbers only. This is arguably one of the most amazing caves in Hawaii. 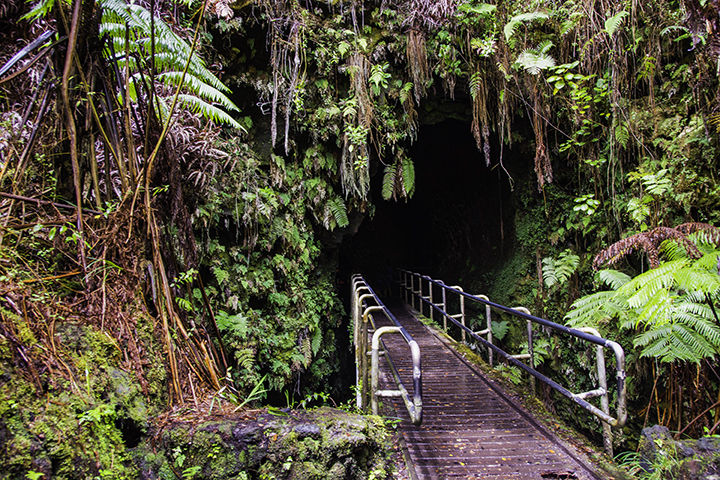 This cave is actually a 25-mile long lava tube near the town of Hilo. The most of the lava tube is not open to the public. But avid visitors can walk into the exposed opening of the cave and admire the wet green walls and the rainforest-like roots and vines. There are also picnic tables and restrooms nearby. 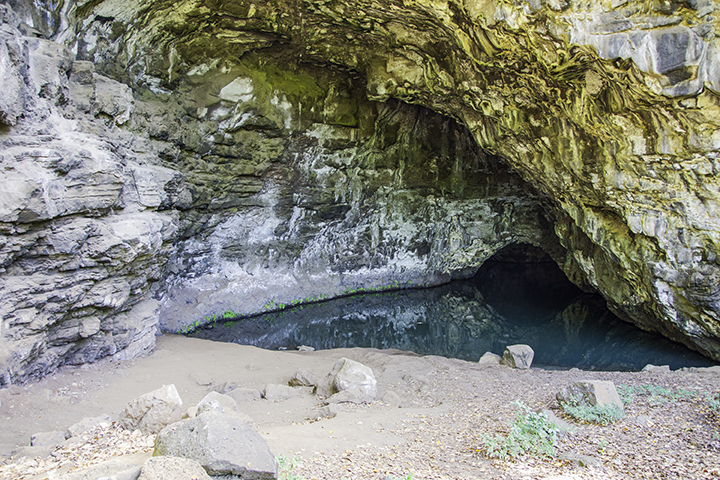 There are two wet caves and one dry cave in Haena State Park. Visitors can see the first wet cave, Waikanaloa, and Maniniholo, a dry cave, from the road. But you can only view the second wet cave, Waikapalae, through a short, but uphill hike. You may also recalling seeing the Waikapalae Wet Cave in the film Pirates of the Caribbean: On Stranger Tides. We recommend you hike to Waikapalae Wet Cave when the sun is north of the area. At this time, you can see a blue glow reflecting from the water. All of the wet caves may look mysteriously enticing. But they are not safe to swim in as the water contains extremely hazardous bacteria. At 1,155 feet in length, this is the second longest sea cave on earth. It’s accessible only by boat on the Na Pali Coast. Arguably one of the most awe-inspiring sea caverns, the volcanic rock formed a tunnel where the adventurous can get close up views of the cascading waterfall inside. Another popular name for this sea cave is the Double Door. This is because there is a separate exit and entrance between the dark chambers. This sparkling park on Maui features sea stacks, blowholes and a black sand beach. Here, you can see the most fascinating features of the park, the anchialine pools and wet caves. Anchialine pools are landlocked bodies of water with a subterranean connection to the ocean. At the Wai’anapanapa State Park, the blue water pool in one of the more notable caves glistens beneath green crusted rock, making the perfect hiking destination and photo opportunity for any tourist driving along the famous Hana Highway. You can find this lava tube along the Hana Highway. It’s also known as the Hana Cave or the Hana Lava Tube. It is one of the safest caves to explore on the island of Maui. Here, you can do a self-guided hour long cave tour with their families through the lava tube’s weaving passages. For people 15 years and older, a 2-hour walking tour is also available. On the leeward side of Oahu, Kaneana Cave is over 150,000 years old. Hawaiians named Kaneana Cave after Kane, the god of creation and was once a kapu or forbidden place. Explorers need to stay on the main path of the cavern, since the side passageways can be dangerous.